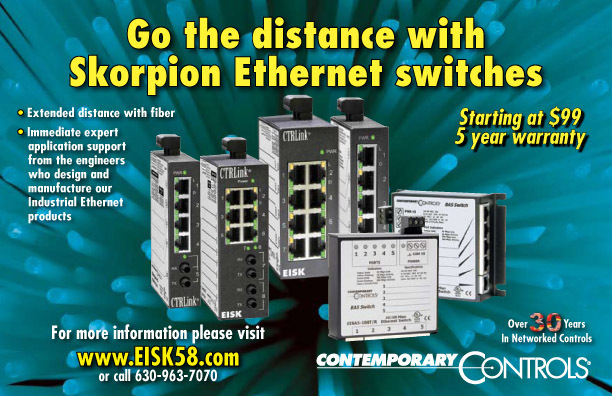 Use your existing Ethernet infrastructure and save money, time, and aggravation. Today’s buildings are being designed with an Ethernet infrastructure in place to carry phone and data services. Ethernet connectivity is everywhere in a typical structure. In fact, I’ve heard customers say their building could never collapse just because of the shear volume of cables that exist. So why not take advantage of all this “free” wiring for your next building automation upgrade? This is an annoying utterance, often heard, as you try to bring a project to closure. You need to add another point (or two) and no BAS cable is in the area. Why not use the existing Ethernet infrastructure? It’s there, it’s free. Contemporary Controls provides two possible solutions for adding the missed I/O point, namely the BAS Remote I/O and BAS Router. With the BAS Remote I/O, $395.00, a direct connection to Ethernet is provided. Attach your analog and digital I/O points to the BAS Remote’s universal I/O connections and you’re up on Ethernet without the need of an external router. This saves the cost of purchasing and installing the proprietary BAS cabling and may gain you LEED’s points as well. Keep in mind that the universal I/O are truly universal, allowing each of the six points to generate an analog output signal or accept an analog input signal of 0-10 VDC or 0 -20 mA, in addition to providing input capability for thermistors, contact closures, and pulses. The BAS Remote is typically powered with 24 VAC (24 VDC is ok too), and provides a 24 VDC 150 mA loop power source―meaning no additional DC power supply is required to power up loop devices. The other solution is the BAS Router, $295.00. If you have BACnet MS/TP devices to install, but no MS/TP home run is available, use a BAS Router to make the BACnet/IP to BACnet MS/TP connection. With the BAS Router you can use the Ethernet infrastructure and locate the MS/TP devices where you need them. You can take advantage of the many MS/TP devices in the marketplace and connect them to any BACnet/IP enabled controller. And of course, if you’re trying to maintain a standard selection of spare MS/TP parts, you can employ the same MS/TP devices for connecting to MS/TP controllers as those used for connecting to the BACnet/IP controller. Need to add some additional MS/TP I/O to your MS/TP controller, but the cabling is not where you need it. Here’s the two BAS Router solution. You probably have easy access to your MS/TP controller. Install a BAS Router next to the MS/TP controllet and plug the BAS Router into the Ethernet network. Maybe you luck out and there is an Ethernet port in the same Mechanical/Electrical closet as is the MS/TP controller. Determine the location for the additional MS/TP I/O. Once you know the exact area, add a BAS Router, power it up, connect to the Ethernet, and wire the MS/TP communications to the MS/TP I/O. In this way, you can use the entire building Ethernet infrastructure to locate the MS/TP I/O anywhere. BAS Ethernet Switches provide infrastructure solutions for Ethernet connectivity. CTRLinkÒ Industrial Ethernet switches are designed with the building automation installer in mind. These plug-and-play switches provide various mounting options like bolt-down or DIN-rail mounting. All switches are designed to power up easily, using available 24 VAC, power 24 VDC is fine as well. Since they are plug-and-play there is no configuration or set up required. Data rate (10/100Mbps), flow control, and duplex are all auto-negotiated. In fact, each port supports Auto-MDIX which determines the proper connection of the transmit and receive lines allowing communications to the end device. The Auto-MDIX allows all cables to be straight-through―making cable construction/selection simple. Easy to view diagnostic LEDs provide information on the data rate and activity of each port. A documentation label on the unit provides an area to mark down connection information to aid in future troubleshooting. UL508, cUL and CE regulatory markings appear on each unit.